EXECUTIVE SUMMARY: Over the past three years, Israel has acquired greater priority and visibility over other Middle Eastern countries on India’s diplomatic radar. Indian Prime Minister Narendra Modi can be credited with elevating the strategic dimension of the Indo-Israeli partnership by bringing the bilateral relationship out from under the carpet. 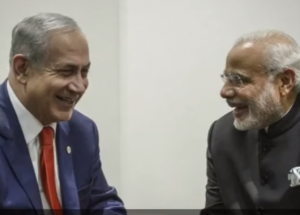 Indo-Israeli strategic ties are at a historic high with Modi visiting Israel in July, the first visit by an Indian prime minister to the Jewish state since the establishment of diplomatic relations between the two countries in 1992. Modi’s epoch-making trip is likely to give an unprecedented push to efforts to build new bilateral relations and further solidify security ties between the two countries. During the Cold War, India’s close ties with the Palestine Liberation Organization (PLO) and reluctance to denounce the acts of terrorism it committed made India suspect in Israeli eyes. However, Israeli leaders demonstrated considerable understanding of the constraints behind India’s politico-diplomatic support for the Palestinians against the backdrop of New Delhi’s concerns over Pakistani efforts to mobilize the Arab states against India on the issue of Kashmir. Given India’s risk-averse and neutral Middle Eastern diplomacy, Modi’s Israel visit is a major departure from his predecessors’ policy of equivalence in dealing with Israel and the Arab countries. Modi’s foreign policy advisors rightly calculated that political and sectarian differences among the Arab countries have transformed their relationships with Israel. Consequently, India’s growing tilt towards Israel might not have much impact on its own relationships with its traditional Arab partners. Since 1992, the Indo-Israeli dynamic has improved tremendously, as reflected in a significant upward trend in defense cooperation, intelligence sharing, and counterterrorism. Israel is India’s second-largest source of defense equipment. Defense cooperation –the central pillar of the relationship – has increased dramatically under the Modi government. As per the SIPRI data for 2016, India’s arms trade with Israel has increased 117%, from $276 million in 2015 to $599 million in 2016. Indian acquisitions from Israel range from Phalcon AWACS (airborne warning and control systems) and Searcher, Heron, and Harop UAVs (unmanned aerial vehicles) to Aerostat and Green Pine radars and several types of missiles and laser-guided bombs. India has entered into significant defense collaborations with Israel, including developing Barak-8 surface-to-air missile defense systems with India’s Defense Research and Development Organization (DRDO). Last year, India cleared procurement of Israeli combat radio sets for the Indian army. Israel’s state-owned Israel Aerospace Industries (IAI) recently signed a $630 million deal with India related to the supply of LRSAM (long-range surface to air missiles) systems to four ships of the Indian navy, giving a boost to the “Make in India” campaign. Later this year, the Indian Air Force is scheduled to participate for the first time in an air combat multinational exercise in Israel. The exercise, Blue Flag, will include six other nations – the US, Greece, Poland, France, Germany, and Italy. There are other tempting possibilities to be explored in the realm of defense cooperation. As stated by Israeli Prime Minister Netanyahu some time ago, “the sky’s the limit” for Indo-Israeli cooperation. A combination of factors led to the emergence of a strong security partnership between India and Israel in the 1990s. The rise to power of the BJP contributed significantly to this development. Following the 1998 nuclear tests, India was isolated internationally and subjected to severe military sanctions. But Israel did not condemn the nuclear test and resumed defense exports to India, enhancing its credibility as a reliable arms supplier. Assistance from Israel in the aftermath of the 1999 Kargil conflict with Pakistan further enhanced the Indo-Israel security partnership. The 2008, the Mumbai terror attacks – planned and engineered from Pakistani territory – once again exposed the glaring inability of the Indian state to control its borders, process actionable intelligence, and preempt and counter terrorist attacks. The urgent need to address the grossly inadequate, fractured nature of the Indian security apparatus aroused a growing interest in Israeli counterterrorism methods. Israel has provided India with satellite photo imagery, unarmed vehicles (UAVs), hand-held thermal imagers, night vision devices, long-range reconnaissance and observation systems (LORROS), and detection equipment for counterterrorism purposes. India has already adapted several Israeli techniques and methods in countering terrorist threats emanating from Pakistan. New Delhi has held regular talks with Tel Aviv on counterterrorism within the framework of a Joint Working Group set up in 2000. During Israeli President Reuven Rivlin’s landmark meeting with Modi in New Delhi in November 2016, counterterrorism was one of the priority areas of discussion. India’s internal conflict theatre covers diverse categories, including non-conventional war, low-intensity conflict, proxy war, insurgency, and non-combat operations. Despite the fact that the roots and nature of the terrorism they face are different, countering jihadist terrorism is a challenge for both India and Israel. The terrorism directed against both countries is sponsored by their neighbors. India has found it useful to study Israeli approaches to cross-border terrorism, because Israel has developed remarkable technological and operational capabilities in its fight against this problem. Israel guards its borders from serious threats on all sides with the help of first-rate surveillance equipment. Delhi is very eager to take advantage of Israeli expertise in the field of infiltration prevention, as both the eastern and western borders of India are highly infiltration-prone. Israeli equipment can also be very useful in bringing down border problems with China, where India often falls short. Similarly, Israel can share its expertise with India on how to keep common dangers such as al-Qaeda and ISIS at bay by adopting special counter-terrorism and forensics techniques. India’s ruling BJP has always been an ardent supporter of stronger ties between India and Israel. Its leaders, be they in the government or in the opposition, have continued to express admiration for Israel’s counterterrorism and national security policies. A crucial aim of Modi’s foreign policy is to ensure that his domestic “transformational” agenda is not held hostage to diplomatic or military adventures of India’s adversaries. Thus, he seems to have developed a strategy that uses hard and covert power, including the use of Special Forces operations—most dramatically highlighted by the surgical strikes India carried out across Pakistan-occupied territory last year. In the spirit of Modi’s comparison of India’s anti-terror surgical strikes to Israel’s exploits, India is likely to give priority to the development of elite forces similar to Israel’s Sayeret Matkal. These dynamics are likely to translate into greater security cooperation with Israel. While the security partnership may not be the sole factor that binds the two countries, it is the most important, because considerations of security have always influenced India’s Israel policy. Terrorist attacks have occurred in India with alarming regularity. In the current geopolitical circumstances, there does not seem to be much hope of reducing the jihadist terror threat in the near future. Although the Modi government is steadily expanding the scope and dimension of its counterterrorism and intelligence-sharing cooperation with Israel, it may encounter limitations, as India and Israel are not directly fighting the same adversary. Similarly, the Indian government faces challenges in using the same kind of counterterrorism tactics that Israel has practiced. The swirl of alignments and animosities among state and non-state actors makes it challenging to organize a coordinated international response to terrorism, but the challenge must be met. The violently anarchic political climate in the Middle East, caused by jihadist radicalization, is adversely affecting regional security. There is thus an urgent need for India to strengthen its counterterrorism ties with Israel. While counterterrorism is usually the province of government, expanded efforts involving academic institutions might foster frank exchanges on the lessons of past counterterrorism and counterinsurgency campaigns waged by both sides and bridge Indian and Israeli perspectives. Prime Minister Modi’s commitment to build on the momentum in Indo-Israeli ties established 25 years ago remains unparalleled. His government has invested a huge amount of political capital in Israel since 2014. Modi has a great opportunity to emphasize the fact that a strong India playing a larger role in world affairs is good for Israel.